Wearing ruffles and vichy print (or gingham print) are almost everywhere during this spring 2017. From work to dinner or a casual look, you can not go wrong with this style. The Vichy trend inspired from Brigitte Bardot is very fresh and cute, and is totally timeless since the 60’s. To add a modern twist to the vichy print, wear it with ruffles, or as a layering piece, or as an oversize top with embellished sleeves. The most famous colors for Vichy are definitely black, red or blue. However this season, you can also see it in orange and purple, like on the runway of House of Holland. I like to wear a classic black and white vichy print and to mix it with a pastel color, like this blue faux-suede motorbike jacket. 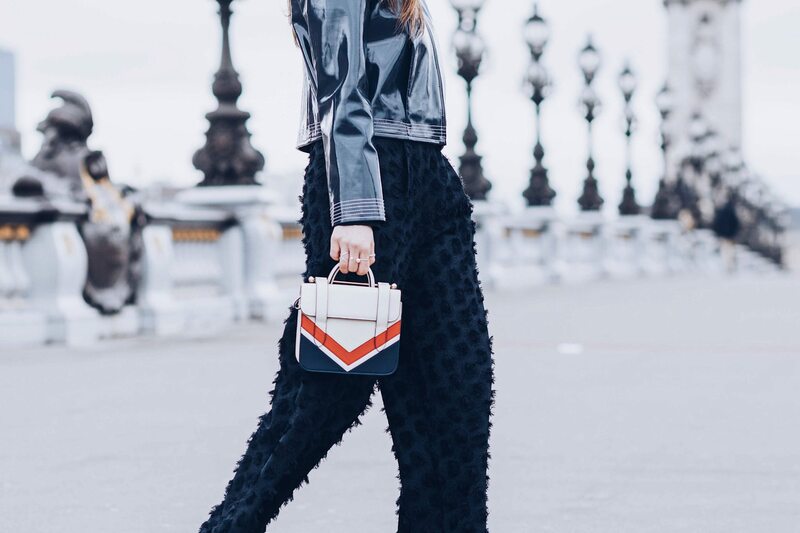 Last fall, we discovered the amazing shoulder bag strap trend. This strend is still strong this season and also for the next Fall 2017 season, you can find beautiful guitar straps at Rebecca Minkoff, Marc Jacobs or Minusey. More Vichy inspirations from Zara, click here. 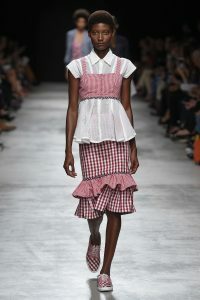 Gingham and ruffles will always win in my book! Love love love gingham and frills. I can’t get enough of it at the moment! The ruffles are so adorable! And dying over the light blue jacket! OMG THOSE GINGHAM PANTS! I’m lovingg this trend! Love this trend and loved how you styled it! I ve always loved gingham! 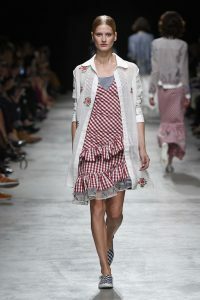 So happy it s fashionable this season! These pants look HOT on you Julia! 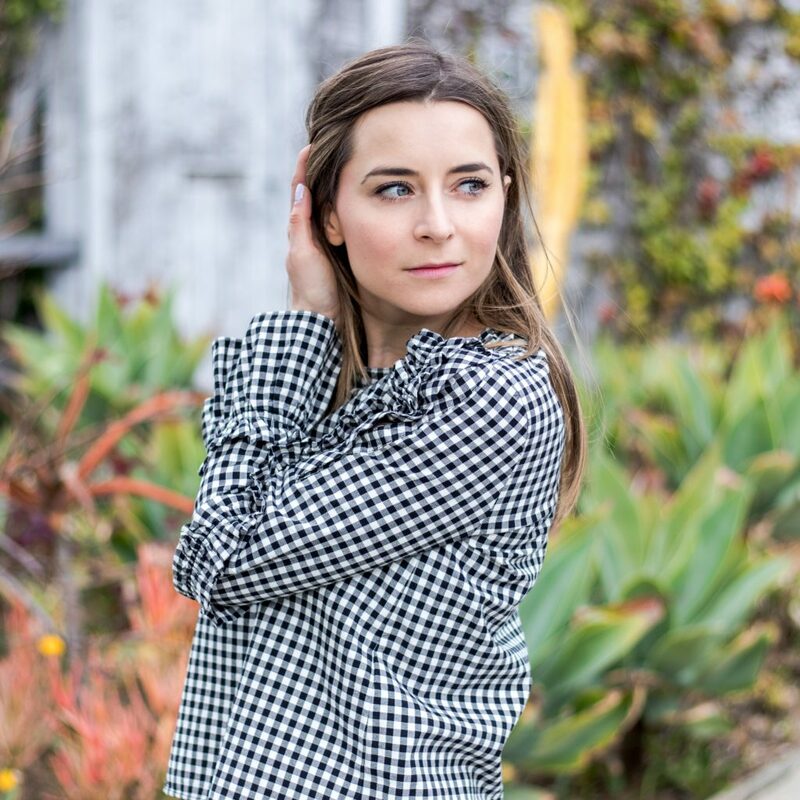 Sounds like it’s time for me to give gingham another try it looks fabulous on you!